In Albania, we expect stronger economic growth in 2013 based on a substantial increase in public wages and infrastructure investment boosting up aggregate demand. 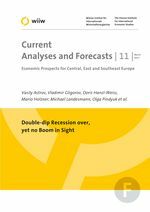 A similar rate of growth could be also maintained in the following years of 2014 and 2015 given an improvement of economic sen- timent throughout Europe. However, there are considerable downward risks. A failure of the Albpetrol privatisation could endanger the financing of fiscal expansion and infrastructure invest- ments. Also another drought could cause further shortage in the electricity supply, which apart from endemic corruption, is one of the major obstacles to more FDI in Albania in the medium run.